The start of the Series is in sight, and the excitement for the QIPCO Guineas Festival is palpable. I’ve been exercising some really nice horses throughout the winter and spring and they should all be out in the next few weeks. It’s a great time of year, and I’m as excited as I’ve ever been for a new season. I’ve got some really good support this season, with a host of trainers providing me rides. I just want to get on with the job, and hopefully thank them all with some winners. And so to Newmarket on Saturday, and the QIPCO 2000 Guineas. As with all renewals of this race, there’s been plenty of top quality opposition declared. I’ll be on board Roaring Lion for John Gosden. I sat on him on Wednesday morning and he seems fit and raring to go. He’s as good as we can get him and I look forward to seeing what he’s made of coming off the back of his Craven defeat. He came up against a fit horse that day, and he’ll be all the better for that run. I’m very happy about the draw in 12, we’re around some fancied horses which should ensure we get a good tow into the race. Masar who beat him in the Craven is in 14 and I’ve no doubt William Buick will try to make the running again. One tick in the box for my lad is that he does have a lot of racecourse experience. He’s won a Group 2 there last year and ran in the Craven there last time out. He’ll be more than comfortable on the track. Like I’ve said before, it’s a very hot race. Aidan O’Brien, as he usually does, holds the key with Gustav Klimt and Saxon Warrior. I’ve not ridden either of them, but having watched reruns of all their races and raced against Saxon Warrior, I’d say Gustav Klimt probably has the better chance of the two. 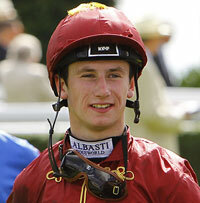 Another ride I’m excited about on Saturday, is Andrew Balding’s, Count Octave. He desperately needed the run first time out at Wolverhampton and on the face of it he only just scraped home. However there was a lot to like about that performance as he hit the line well at the end and he’ll come on plenty for the run. He’s in a pretty good race on Saturday, as it should be with the prize money on offer. Most notably, Defoe was very impressive at Newbury, there were only five runners but he did it well enough. Count Octave does have a bit to find on ratings, but if he does step up he will certainly give them something to think about. In the opener that day, I ride Spark Plug who I know very well. I saw him this morning and he looks really fresh and happy. He’s done a lot of work over the winter so will be race fit. Back in handicap company on the setting of his 2016 Cambridgeshire win, I think he goes there with a big chance. On Sunday, the QIPCO 1000 Guineas takes centre stage and I’m on the outsider Worship. We think plenty of her at home. She’s stepping up in trip from 6 furlongs to a mile, which is a bit of an unknown. This race has always been her target and she’s done plenty of work in preparation and will take her chance. Of the competition I was very taken with Soliloquy‘s win at HQ last time at the Craven meeting, with William Buick steering her home well. I think she can run a big race. I have ridden Aidan O’Brien’s I Can Fly in work before. She’s defintely improved physically from two to three, and I think she will go well too. In the Listed Pretty Polly Stakes I’m on board Kinaesthesia. I won a Nottingham maiden on her, she’s really strengthened from last year. Although this trip maybe on the sharp side, as she’s bred for further. It’s a tough race, with the eye-catching Lah Ti Dar listed in the entries for John Gosden. I do think a lot of mine though and she’s certainly one to keep an eye going forward. She’s done well from two to three. She’s off a mark we’re hopeful she can be competitive off.